I think I've mentioned before that my mother used to have an expression she used when she was having a bad day..."I should have stood in bed". Well, today was one of 'those' days. DH and I decided it would be a good day to do our grocery shopping (the store we prefer is over half an hour away). It's pouring rain and it was a case of Mother Hubbard's cupboards were getting bare. So...we set out. Over half way there it suddenly dawned on me that we don't get paid until tomorrow!! Oops...can't get groceries. Neither one of us even thought of the date when we set out. Oh well...at least the car got washed. The picture today is a re-tread of one I had on here many moons ago, but I know I have some new readers who haven't seen them. Enjoy! Yep, that's me right now. The trees are 'doing something' which means my allergies are rearing THEIR ugly little heads, and making MY head hurt! At least there's one good thing about winter...the snow covers up the leaves and I can breathe. Today I spent working on another Christmas present and on a piece of mail art, which is hopefully heading out in the mail tomorrow. It's going to be fun to see what the postal person has to say when they see it. The picture was taken a couple of weeks ago, just after Jack tied a rope around all these flowers to keep them more or less upright. The sunflowers were so heavy and were crushing all the cosmos. Right now the little goldfinches and chickadees really like our garden! Anyone who happened to see some black smoke issuing forth from this direction must have tuned in to my thought waves this afternoon. I was trying to sew on a Christmas present (I can't show you what it is!) and things were NOT going well. My machine was arguing mightily about stitching through anymore than two layers of fabric. I rethreaded it numerous times (muttering, which then evolved to full-fledged cursing) because the thread kept breaking. I changed tension, I cleaned the machine, I tried a new needle, I tried a different spool of thread...a different bobbin. Nothing worked. I even resorted to hauling out machine #2 (which hasn't seen the light of day for at least five years...and didn't want to see it today either, I might add). Finally, my little pea brain registered that maybe...just maybe...sewing through numerous layers of fabric (one of which was denim) MIGHT just go better with the use of a jeans needle. Success!! Now, can somebody tell me why it took me over two hours to figure that out??? The picture above is in our garden, and the one below is an atc I made with a fall theme. Now I know why my feed list is going slightly crazy! SharonB has kindly listed my blog on hers and people are popping in to see what I'm about. 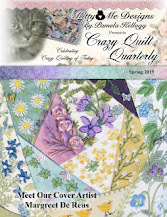 Welcome to everyone, feel free to look around (check the archives if you're interested in crazy quilting) and please do leave a comment to let me know you've visited. I lucked out (I think!) when I was gifted with this little thing. It's a Rhinestone and Stud setter. Unfortunately it didn't come with any rhinestones OR studs (of any variety...two-legged or otherwise) so I'm not able to test it. It came with instructions, which is a good thing - and it tells me what types of 'bits' I need to get. Now just have to hope I can track them down somewhere. For now it looks pretty cool sitting on my worktable. Now, how's THAT for an interesting title!? Today was our CQTeers group meeting and Irene and I (Sue & Kym were away) had great fun doing a 'share' session. She does some of the most interesting (and creative) things and I love seeing her work. Irene was on a trip to Japan last year and learned to make these wonderful bags called Furushiki. They are so very simple to make and are very practical. The 'base' is just a large square of fabric and the whole thing is created with knots. This was the one I made, in a purse-size. I'd like to repeat it and make one twice as big to use as a shoulder bag. I know that it just looks like a blue blob here in the picture, but trust me - it's great! Google the name and I'm sure you can find out more about it. Our theme this month was ink blots or fall. Below are the atcs I made (atc size). The top row reminded me of people, so I scrounged around & found some wee polymer clay faces I'd made a couple of years ago. While I was looking for those, I stumbled onto the brass hands - perfect! The bottom row of blots reminded me of faces and were 'done' when I added some googly eyes I had in my stash. Great fun! We talked and laughed and ate copious amounts of chocolate, including wonderful chocolate-dipped strawberries...yum!! Thanks Irene for a great day! Yet another picture from our garden. This little rose is bravely blooming at the foot of some iris'. I was quite fascinated with the fact that both blooms are on the same plant, but are so different. I spent today sewing with a couple of friends (actually I crocheted). Jacquie is working on a denim quilt for her youngest son using 3 1/2" squares I cut from my scraps leftover from making the bags and the jackets. Great use for my scraps! Julie was working on finishing a beautiful (albeit small) quilt top she found at the thrift store. She's putting a wide border on it and then giving it to her 94 year old mother to quilt. What a great way to make her mother feel useful and what an heirloom to pass down in the family. I worked on a Christmas present (that I can't show...yet). We 'did lunch' and had a grant time chatting. Tomorrow I have another crafty day to look forward to with other friends...I'm lucky!! How's that for a title that grabs your attention? Anyhoo...here's a picture of our butternut squash crop. I have visions of brown sugar/butter and some soup dancing in my head. Yum!! As for the sites, I have two that you should check out! http://www.nordicneedle.com/CTGY/A05-93-00.html Each one is clickable. No affiliation with either of these companies, but they are both worth having a look at. I finished working on the latest Corpse piece this afternoon and then did some playing around. The first picture shows a piece of 'packing' from a box of chocolates and what happened when I ironed it between two pieces of parchment paper (on the bottom left) and zapped it with a heat gun (bottom right). The ironing took the shimmer out of the paper and left a few holes in it. The heat gun, in a split second, shrivelled it up into a hard clump. Next I played with a piece of gift wrap which is blue on one side & silver on the other (mylar, perhaps?). Original 'stuff' is the large piece, ironed bit is at the bottom of the picture, and the heat gun created the lovely textured bit on the right. This I really liked! The heat gun won this round. Finally, I worked with some more gift wrap - in a lovely copper colour. Maybe mylar again...not sure. The top of the photo shows the result from the heat gun and below is the iron. I thik the heat gun won this round too, although (to be fair) the outside edges of the ironing is nicely textured. The middle (likely too much heat) seemed to stay flat. All of these will be additions to my 'component box' (thanks Arlee!) for future use. ......I could show you what I worked on today!! The latest Exquisite Corpse piece is in my hands and I'm inspired and so excited about what I'm doing. We are sworn to secrecy though, and I can't even show you a tiny little corner until they are all revealed at the end. Shucks! So...here are a couple more pictures from our garden instead. The first one shows just part of the jungle we have going on here. A summer of rain (quite unlike last year when we had very, very little and things struggled to survive) has led to a total over-abundance of flowering things. I'm not complaining, mind you. The second picture is showing three of the blooms on our hibiscus (found out the proper name). I know I showed it before, but I couldn't resist taking another photo. You can see Jack's hand propping them up so you have some idea of scale. Dinner plates come to mind! There are tons of buds on the plant yet to come, so we are hoping that the frost will hold off. Aren't they gorgeous? I have had a wonderful artsy inspiring day with my friend Irene and now have all sorts of ideas percolating in my little pea brain and am absolutely dying for more time! First we went to a place called 'Gallery On The Lake' at Buckhorn to see a fabulous showing of mixed media art by Hilary Rice. If you go to www.galleryonthelake.com you can see a slide show of some of the pieces. Awe-some!! I'm sure they must have wondered about Irene and I, because we went around the whole show with our noses practically pressed up against each piece of art. (Isn't it 'the thing' to view art from afar?). We had to see every detail and there was plenty to see (and inspire). I want to do this stuff!!!! (We won't mention that Irene & I dashed to the car afterwards and make lots of notes for future reference). We then stopped at a lovely little gift shop where I was a very good girl and didn't buy anything, despite being quite covetous about several things. Then it was onward to visit an art showing in our local gallery here entitled 'Letters Home' by artist Linda Finn. Sorry I can't show you pictures of any of it though. It also is a mixed media show - she used copies of old letters from the world wars to create her art. Very sobering, but also very inspiring. We finished our day with coffee at my favourite local coffee house and then stopped in at the florist that is close by to pick their brains for artist materials we could use. The picture shows the 'stuff' we scored. Don't know quite what I will be doing with it yet but there sure are lots of possibilities. I had a great day, in great company, seeing great things. I'm a happy camper! Here's my Take It Further challenge piece for September - finished! If you remember the 'problem' I had at the first of the month with my computer printing pink, rather than the gold that showed on Sharon's site - you will know why I used pink, rather than gold on this square. I quite like it this way, altho' I think gold would have been just as good. As usual, the photo is clickable to show you more detail. Enjoy! I managed to get a whole afternoon to stitch and I made the most of it! You will notice I removed that seam I heartily disliked and replaced it with an algerian eye stitch. Below that is a double row of cretan stitch. Below that, between the pink and dark blue fabrics, are three Renaissance stitches (from the A-Z of Embroidery Stitches book 2). Beside that, I used a gold metallic thread to do a seam in sorbello stitch (also from the A-Z book). I loved that treatment, but I'm not sure if it's because I like the stitch or the fact that it was done in something SPARKLY!! To the right of the flowered patch I did an alternating blanket stitch. Below that is a row of blanket stitch, straight stitches and beads. I attempted a double row of arrowhead stitches just above the clump of off white beads & sequins. I'm not so sure about that particular seam because the underlying stitches don't seem to show. It might not stay. The final two areas I worked on were on the bottom left...a wheatear variation, highlighted with beads on the seam and, above that a fly stitch circle on that short bit of seam. Whew! I love having a whole afternoon to just stitch! I certainly didn't have much time again today to stitch but I did a couple of seams. The pink seam on the left is Raised Chain Band and the smaller pink seam (in the middle) is the Alternating Diagonal Stitch both from the book "A-Z Embroidery Stitches 2". I really like the chain band but will never repeat the alternating stitch. It might just be removed the next time you look at it! Here's the progress so far on TIF for September. I made the lovely white heart on the right side using the yo-yo maker that Freda sent me last week...with an old earring for the centre. Pretty! Above that is an antique piece of lace highlighted with some beads. To the left of the yo yo is a heart shaped seam treatment which is actually a pattern for Chicken Scratch (found on CorgiPants blog), done using waste canvas. The lower right seam treatment is one I'm currently working on and it came from Annie's Crazy World blog. It's beautiful! The ABC's part of this post is to point you to Mary Corbet's blog at http://www.needlenthread.com where she is currently doing another series of letters for monograms. This time they are of Celtic origin and very pretty. Even if you aren't interested in letters, be sure to check out her blog because it is absolutely full of great information for embroiderers. Jack and I took off for a sanity day today, and also to celebrate 29 years of wedded bliss (or something like that!). These are a couple of the pictures I took. We clamboured over all these rocks in order to get some pictures. This was some brave (or incredibly stupid!) soul on his descent down a sheer rock face, which he then proceeded to climb back up. You sure wouldn't get me up there, but it was certainly interesting to watch! We completed our day with a tour through the most fascinating little touristy gift shop, where I could have bought all sorts of treasures - but didn't. AND a great supper out with completely over-the-top decadent Bailey's Irish Cream cheesecake for dessert. A perfect day! This flower, hidden in our back garden, is as big as a dinner plate! By the look of it, there will be tons more provided all the buds continue to do their thing. Beautiful, isn't it! There's plums on our tree! We're excited because it's the first year we've had any. They're not ripe enough to eat yet...but soon. Yum! Just take a look at what was in my mailbox this afternoon...a big squishy bag of goodness from Freda! The first picture shows two beautiful pieces she did on her embellisher. The picture absolutely does not do justice to these pieces!! The top piece sparkles. Love them both! AND...more goodies were in there. A beautiful fabric mermaid...two wonderful collage pieces (one printed on fabric and the other on paper)...and two yo-yo makers! One makes hearts and the other makes flowers & are manufactured by Clover. I haven't seen them here in Canada, so they're going to be such fun to play with. Freda even made a sample heart for me to see and included it. I'm a pretty happy camper right now...thank you SO much Freda!! This deserves a post of it's own, so here it is! My friend Marie Alton of SREDeluxe fame (AND an oft-published designer) has just opened her new internet store and already has some pretty cool beaded designs available (along with some very exciting freebies that will be going along with purchases). My 'claim-to-fame' with these is that I've been her personal shopper and have found her some of the beads she's been using in her designs. Word has it that she may just be a featured artist in the all-Canadian magazine called A Needle Pulling Thread too. I'll let you know if and when it happens! 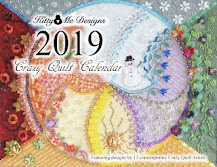 In the meantime, please check her out at http://sredeluxe2u.blogspot.com and check back regularly as she adds new designs. I know for a fact (having seen a lot of them) that there's some stunning things on the way!! Marie also blogs her work at http://sredeluxe.blogspot.com. I finally decided that I would go with the colours my computer was printing out for this month's piece and the picture shows how far I have gone with it. It seems so strange that no matter what I did, my computer insisted that what I saw on the sites as being gold, really was pink. I rather liked the pink with the other colours, so that's what I ended up with. 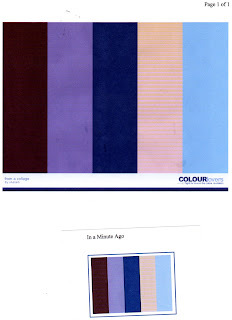 Here are two scans of the several print-outs I've done of the latest colours for the TIF challenge (see http://sharonb.wordpress.com). The top one is taken from the ColourLovers site and the bottom one is from Sharon's own site. The colours showing on both places on my screen have the second colour from the right as being gold, while I'm showing pink when I print them out!! (Before you ask, yes I have lots of ink in my printer, so that's not the problem). After much thought and looking through my stash I've come to the conclusion that I'm going with my printout - mainly because, at this point, there isn't much pink in the challenge blocks up until now and there are a couple with gold. So...decision is made (altho I'm still puzzling over the discrepency!). I hope everyone has been having a great long weekend! Isn't it ironic that the last long weekend of the summer should be the best weather we've had all year? This book is a new one I got the other day and I love it! I had read about it somewhere on the internet and it sounded interesting. There are all kinds of techniques to explore in it and tons of eye candy. I like the fact that none of the supplies are overly expensive or, better yet, things I already have. These two books were in our local Friends of the Library sale this month and I snapped them up. I'm not quite sure what the attraction was for the Celtic designs, but they caught my eye and maybe will be useful at some point. The other book was a find! It has a teeny bit of water damage on the top but not enough to harm the book. It also has tons of information and gorgeous full-colour pictures. I thought these were worth $1 each!